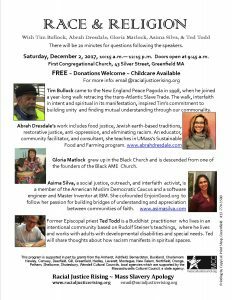 Saturday, December 2, 10:15 a.m. – 12:15 p.m.
With Tim Bullock, Abrah Dresdale, Gloria Matlock, Asima Silva, Ted Todd. 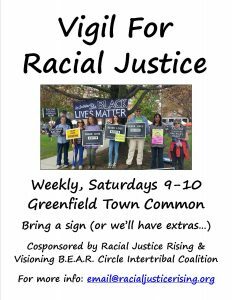 Speakers may share thoughts about the intersection of oppressions, solidarity, interfaith collaborations, & more; as well as their experiences in traditions including the Black church, Buddhism, Judaism, Anthroposophy, earth-based spirituality, and the Episcopal church. Saturday, January 6, 10:15 a.m. – 12:15 p.m. In this extraordinary documentary, an in-depth look at the U.S. prison system offers a history of the country’s history of racial inequality. Do Black Lives Matter To You? Lesson Plan: Thanksgiving Through the Lens of Native Americans Today, from PBS, featuring Wampanoag perspective in articles, videos, etc.